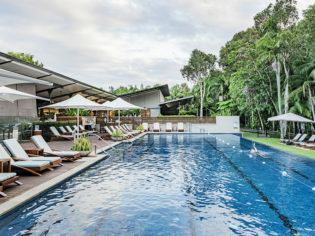 An iconic resort with a fresh new look; does The Byron at Byron still tick all the boxes? Despite its obvious name, while on a recent holiday to The Byron at Byron in Byron Bay, I wake in the middle of the night and forget where I am. Not unusual for someone who travels a lot, but this fleeting moment of amnesia occurs more than once. We visit Byron Bay regularly so it’s not completely foreign ground, but on this trip we experience this free-spirited beach town from a different perspective. Located just south of town, The Byron at Byron is described as the perfect place to get away from it all, set on 18 hectares of rainforest with the Tallow Creek running through it. I immediately note a feeling of calm when we arrive. The receptionist, wearing a colourful and relaxed ensemble by Australian designer Mister Zimi, provides friendly and swift service. The reception space and adjoining restaurant have undergone a recent makeover by interior designer Luchetti Krelle. It is chic and elegant yet unpretentious. Helmed by chef Matthew Kemp, formerly of Sydney’s Banc and his own Restaurant Balzac, the restaurant boasts a large al fresco deck with views out into the rainforest. The striking copper bar is complemented by an eclectic collection of Italian furniture in muted tones, with splashes of steel blue and red ochre. A series of still life paintings of Australian native botanicals from 2015 Archibald Prize winner Julian Meagher adorns the walls while fresh flowers sit pretty around the space. The new look cannot be faulted, nor can the food, which is sophisticated and full of flavour, made from plentiful local produce. The suites were left untouched as they were given a refresh in 2016. Our lower-floor Standard Suite is accessed via timber boardwalks that weave through leafy green rainforest and over creek beds. It has everything we need – a kitchenette, small living area and bath, however it’s slightly lacklustre compared to the new spaces, and the fully enclosed balconies leave our suite feeling a little dark. Venturing in search of some sand and sea, we follow the ‘direct beach access’ to Tallow Beach. It takes us 15 minutes through rainforest and bush, and across a residential street to get there; it’s a lot of effort with a child in tow. Better to join the groups lazing around the resort’s blissful pool, with the tranquility of the rainforest as a backdrop. Walking back to our suite along the rainforest path, we spot a huge python curled up in the sun by the creek-bed. (Those enclosed balconies now seem like a very good idea.) It’s clear we’re a world away from the Byron Bay we know – the sun-seeking backpackers, tie-dye-wearing hippies and boho-chic hipsters; the mish-mash of upscale boutiques and sidewalk stalls of handmade sundries; a hubbub of cheap eats between seriously cool bars and restaurants. It’s no wonder I feel some destination disorientation… The Byron at Byron is truly an escape from it all and a beautiful one at that. The service is brilliant and the newly refreshed reception and restaurant areas are beautifully done. This is the perfect stay for those who want peace and quiet. But if you want the full Byron experience, somewhere closer to town would be more suited. We paid $420 for a Standard Suite including breakfast.